I have had a really interesting couple of days at the Sustainable Foods Summit in São Paulo. 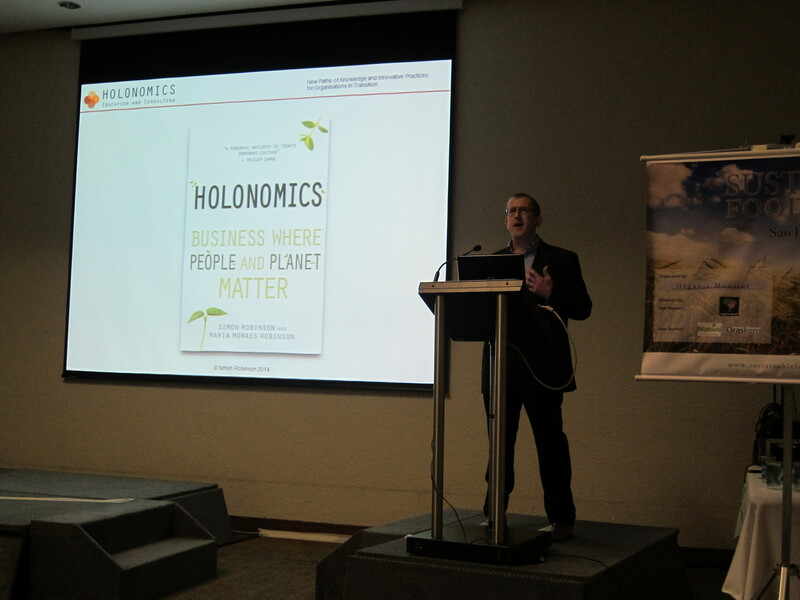 This was the first Latin American edition of this international summit, organised by Organic Monitor, and I gave the opening keynote speech on the second day which focussed on marketing best practices in the morning, and sustainable packaging in the afternoon. The title I chose for my talk was “From Economic Brand Value to Holonomic Brand Value” and in it I asked the questions what is an authentic brand, how can we truly encounter a brand, and what role do human values play? I thought I would therefore share this talk with you in this article. You may be wondering about the word holonomics. Although the word was first used in 1896 to describe a branch of mathematics, we coined a new definition for the word, which can be thought of as the combination of the words economics and wholeness. My wife Maria and I are the co-authors of the book Holonomics: Business Where People and Planet Matter, and this describes a new way of thinking which teaches business leaders and managers how to respond, adapt and communicate in new, innovative ways. This new way of thinking, which we call holonomic thinking, can of course be applied to branding, and so it is this theme I would like to explore. 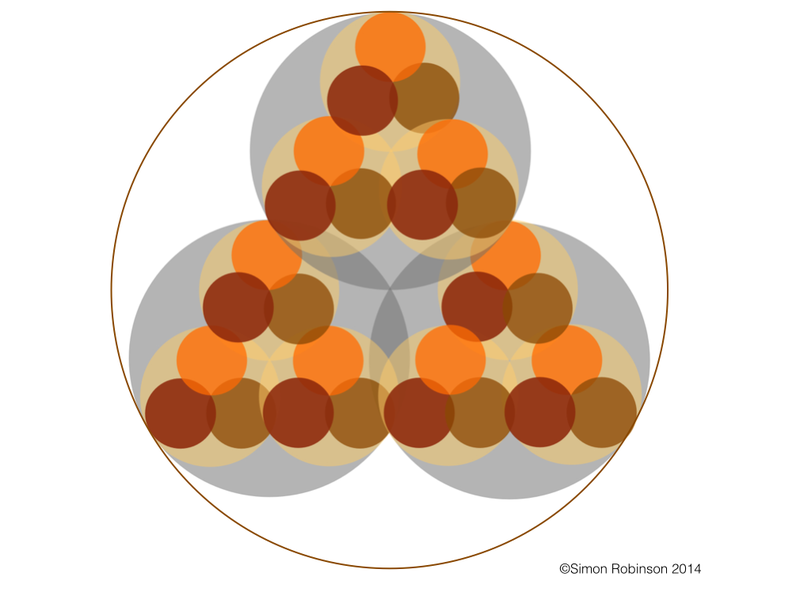 Holonomic brand value relates not just to monetary value, but to ethics and human values. Here in Brazil, in the latest advert for Friboi meat, Roberto Carlos, a vegetarian for decades says to the waiter that he has returned to eating meat because the meat is Friboi. It was widely reported that Carlos is still a vegetarian, despite what he says in this advert. The advert caused a scandal in Brazil, and many Brazilians expressed their anger on social networks. If brands are to promote sustainable behavious in consumers, they have to have integrity, their words must match their actions, and I feel that it is not helpful to have one of Brazil’s greatest role models say one thing, but do another. I am a member of Biomimicry for Creative Innovation. All members of the group have as their mantra ‘Business inspired by nature.” This quote above really captures the essence of this mantra at a very deep level. The quote comes from Dee Hock, the founder of VISA. The original organisational structure of VISA was inspired by the complex and dynamic structures found in nature. One of the key reasons why VISA was successful, and created in such a short timeframe was due to the shared values of all the participants. These values were openness, fairness, trust and confidence. Hock understood the wholeness of nature, a wholeness that most people are not able to see, not able to understand. The reason is that for many of us, the quality of our thinking is limited. Although neuroscientists understood that the brain was not divided into a rational side and an emotional side in the early 1980s, people today still believe this to be true. This advert from Mercedes is just one thousands of examples. The brain is divided, and the two hemispheres do operate in profoundly different ways, but not as we realise. 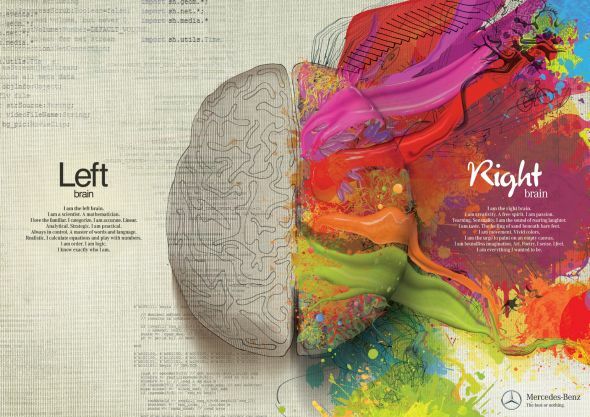 The left hemisphere provides instrumental attention. This allows us to manipulate objects, and use things for our benefit. But this type of attention is narrowly focussed, and it means that we experience reality as fragmented, static and ultimately lifeless. It is the right hemisphere that provides what one might call relational attention, enabling us to see the whole picture, to form social bonds, to inhabit and belong to the world we see, rather than simply being detached from it and using it. However, I would like to suggest that since the era of industrialisation to our modern age of technology, we have become out of balance, and our thinking has become dominated by the left brain way of seeing, especially in western economies. 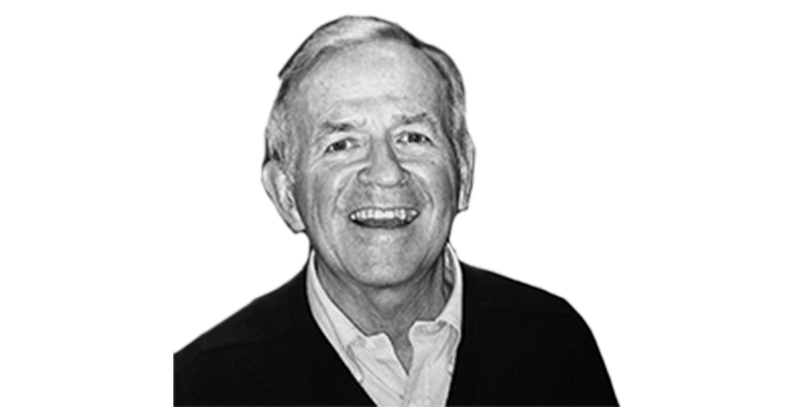 These insights on the divided brain come from psychiatrist Iain McGilchrist, author of The Master and his Emissary: The Divided Brain and the Making of the Modern World. Iain has written a recent guest article for Transition Consciousness which is well worth a read if you are interested in this topic: Guest Article: Iain McGilchrist replies to Stephen Kosslyn and Wayne Miller on the divided brain. Many people today say that in order to solve the complex problems we face, we need a higher level of consciousness. People can develop this higher level of consciousness by upgrading their mental operating system to one which we call the Holonomic Operating System. In the modern business world, dominated by technology, thinking is valued above all other ways of knowing the world. This is the logical, rational and symbolic way of thinking which separates us from the world. Note here that feeling is opposite thinking. Feeling is not emotion. It is through feeling that we achieve a sense of connection to other people and to nature. 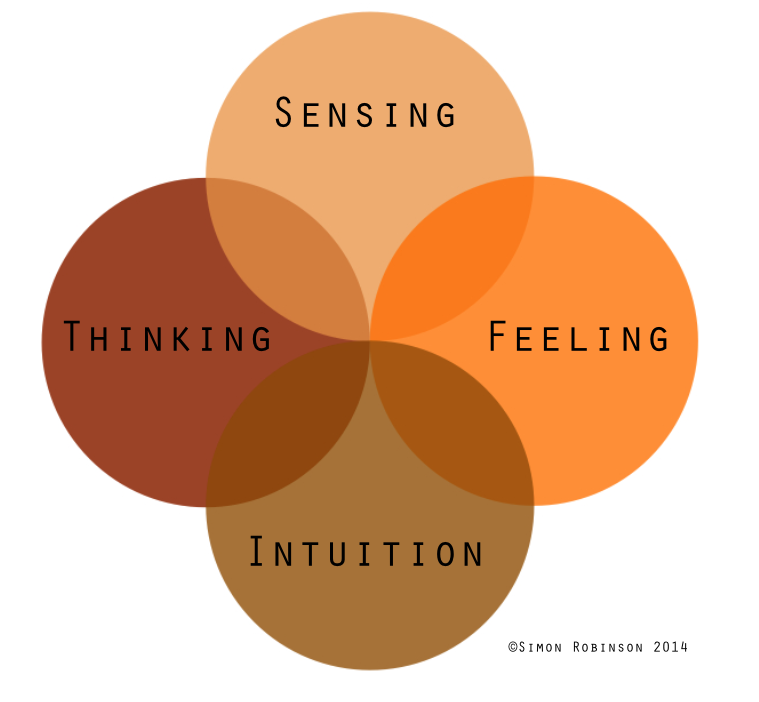 Sensing is the way of knowing of artists, photographers, painters and chefs. Whereas sensory knowing is very concrete, intuition provides us with a much deeper sense of the meaning of phenomena. It is responsible for insights, scientific discoveries and new ways of seeing. Discovering the four ways of knowing can be extremely powerful, especially for business executives who may be really stuck in thinking. 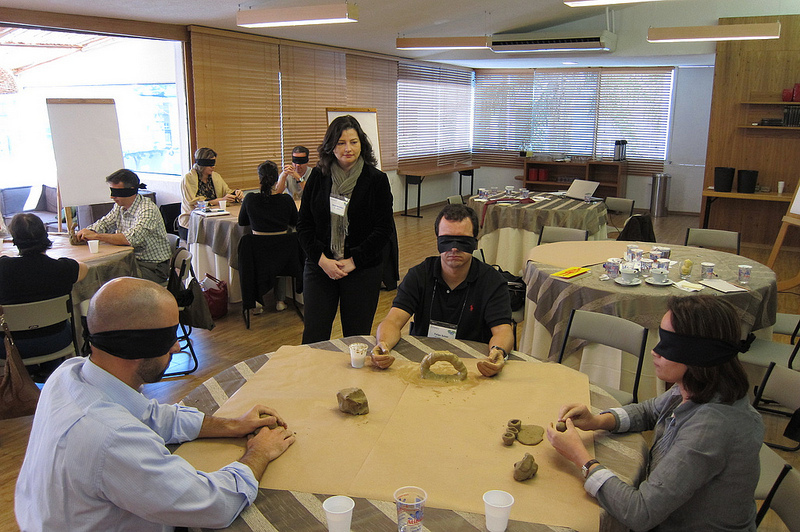 Here is an exercise which Maria and I ran for business executives responsible for strategy in major Brazilian companies. 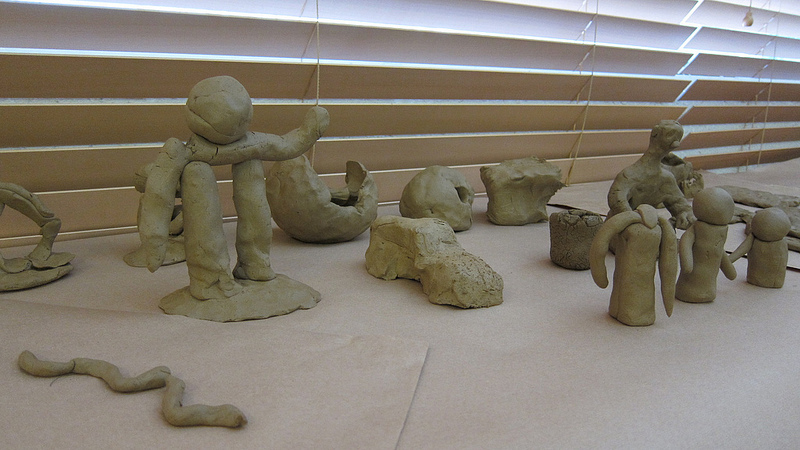 We blindfolded them and gave them lumps of clay. We asked a simple question – with your hands create something which represents your relationship with nature and the concept of sustainability. It was quite remarkable the stories and insights which the executives came up with. Here is a model of a person, and the arm actually broke. The person who made this said that it was representative of the fact that our heads were now out of proportion with the rest of our bodies. In the photo we also see children, and for some people the sense of the clay took them back to their childhoods, the last time they remembered such sensory experiences. Another person created children to symbolise the fact that it was only when he had children that he became interested in sustainability. This exercise was extremely emotional and powerful for those taking part. It can be used to discover new insights about our brands, and new ways to communicate about our brands. There were many excellent businesses and organisations here at the summit. I only had time to discuss one example which was Villa Brasil, a new umbrella brand created by the social enterprise SBrasil, to whom I provide mentoring and advice on branding, marketing and strategy. 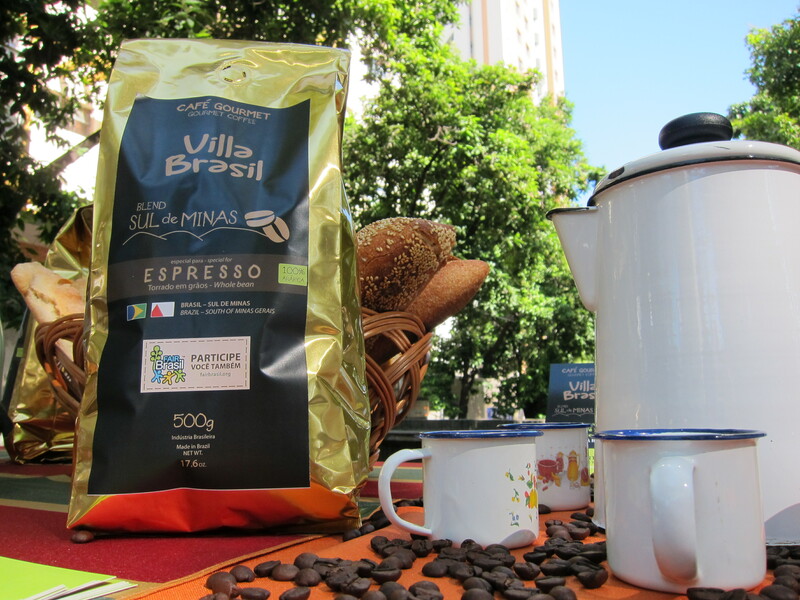 SBrasil created a new mark, Fair Brasil, and currently sell Villa Brasil Coffee to local businesses in Belo Horizonte. What is interesting about the approach SBrasil take is that they are developing authentic ecosystems, ecosystems where each partner in the value chain shares the same set of values. When a partner signs up to the programme, they do not just sign a contract, but also sign up to a code of ethics, which is a demonstration of their commitment to the project in every aspect. Just like ecosystems in nature, this kind of ecosystem takes time to develop, since there is a lot of work with communities and organisations based around the exploration of the code of ethics, which is not imposed, but emerges from dialogue within the community and organisation. Authentic brands are ones which truly connect with their customers, and which truly connect with nature. The meaning of a brand cannot be imposed on others and is not static. Brands have to be allowed to live. I was greatly honoured to be invited to speak at the summit, and I also chaired the first afternoon session which examined the impact, design and advances in sustainable packaging. There were many extremely interesting, wide-ranging and detailed talks, with representatives from Unilever, Walmart, Braskem, Grup Pão de Açucar, Native, WWF, OrganicsBrasil, Intituto Akatu, Ampfy, Creez and Organic Monitor, the London-based organisers of the event. If you are interested in finding more about holonomic thinking, you can read the first few chapters of Holonomics via the preview here on Floris Books. It can be pre-ordered, and is due to be available via Amazon.co.uk and other UK distributors on 7th April. For those of you outside of the UK, the book will also available via The Book Depository on 7th, who offer free worldwide postage. The eBook launches in May, and will be available on Amazon.com in late May/early June. The next European Sustainable Foods Summit will be in Amsterdam on 5th – 6th June of this year, and for more information please see www.sustainablefoodssummit.com/europe. Organic Monitor organise many other events, and the next Sustainable Cosmetics Summit will be in New York, 15th – 17th May. One thing that has struck me over the years is the disconnect between ‘corporate values’ (or, for that matter, ‘brand values’) and feelings. 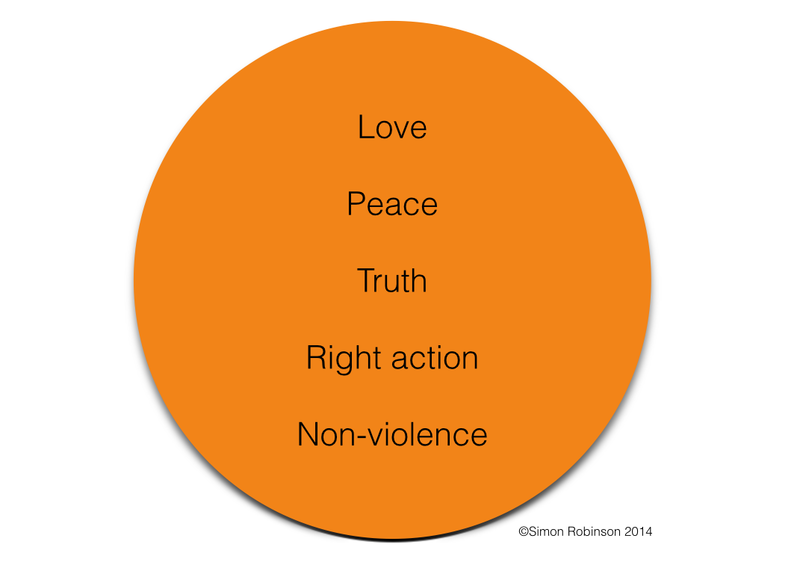 It was the wonderfully commonsense Jungian psychologist Robert Johnson who helped me to see this. Johnson points out that what we value represents the highest and healthiest expression of our feeling function – and that the wounded feeling function of modern humanity is evident nowhere more than in the collapse of values. Valuing is a function of feeling – not of thinking. However organizations choose to express their ‘values’ in the form of abstract concepts and categories: ‘Quality’ ‘Leadership’ ‘Professionalism’ ‘Transparency’ and so on. But to what extent can our feelings really engage with these things? Not only does this seem to require that our (predominantly right hemisphere and embodied, concretely directed) emotions attach themselves to a (distinctly left hemisphere, ‘bloodless’) category but it also deprives us of the opportunity to bring the feeling function fully into the organization. So what do human beings value? In my experience, we value experiences which are situationally dependent. Thus when I work with people in organizations to try to develop ‘appropriate’ brands, I tend to ignore these abstract formulations – ‘mission, vision and values’ – as much as possible. Instead I listen for what causes the people I interview to start to speak with more energy and interest. Here, quite simply, is what they really value – and not what they think they ought to value. These real values can’t be expressed in abstract terms – what is valued in one situation might not be valued in another. Authenticity is important here. And these values can’t be expressed as abstractions. But interestingly they can be expressed through stories.